“This Is My Song” from Christian Faith Publishing author Lynne Harvey Cox is a riveting and entertaining account of a young preacher’s daughter trying to navigate life’s up and downs as a newfound Christian. “This Is My Song”: a riveting and entertaining account of a preacher’s daughter navigating life’s up and downs as a newfound Christian. “This Is My Song” is the creation of published author, Lynne Harvey Cox, a former teacher and employee in the medical field, mother and grandmother. 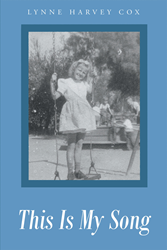 Published by Christian Faith Publishing, Lynne Harvey Cox’s new book is a warm and intimate portrait of a preacher’s daughter. The story is narrated by the preacher’s daughter, Lynna-girl, who tries to make sense of the events that surround the family’s new life as a Christian. The events in this book will take the reader on a roller-coaster of emotions. Read along as the experiences of the past shape the woman of today. View a synopsis of “This Is My Song” on YouTube. Consumers can purchase “This Is My Song” at traditional brick & mortar bookstores, or online at Amazon.com, Apple iTunes store, Kobo or Barnes and Noble. For additional information or inquiries about “This Is My Song,” contact the Christian Faith Publishing media department at 866-554-0919.